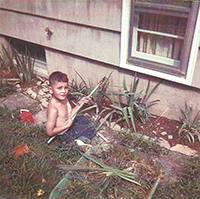 Nick as a child, assisting in Mom’s iris bed. "I have and always had a keen interest and love for the out of doors. I remember specific questions I asked about various plants and trees to my grandmother and mother who were both avid gardeners and a major influence during my formative years."